An 18-year-old is accused of attacking the principal of Archbishop McCarthy High School after he was expelled. NBC 6's Ari Odzer reports. 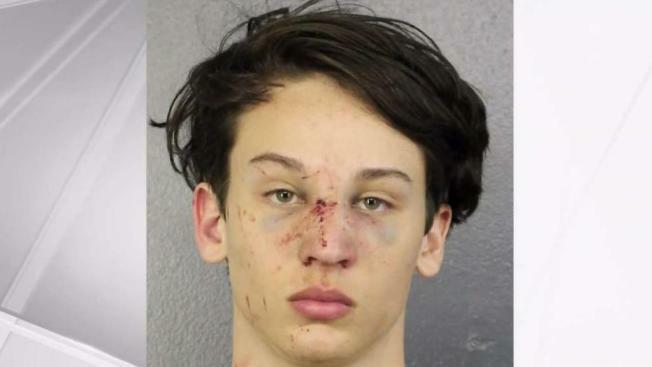 An 18-year-old South Florida man accused of attacking a high school principal who expelled him last year is facing assault and battery charges after an encounter that left the teen bloodied and bruised. Jacob Paul Springer, who had been expelled from Archbishop McCarthy High School in Southwest Ranches, was arrested Saturday in the attack on Principal Richard Jean, according to an arrest report. The report said Jean was driving on Saddle Club Road when Springer pulled up next to him and started yelling and driving erratically. Springer tried to cut off Jean's car and force him to stop, and to avoid a collision Jean pulled into a parking lot on Laurel Drive, the report said. Springer and Jean got out of their cars and Springer started yelling insults and made references to his expulsion from the school, the report said. At one point, Springer moved towards Jean in a "fighting position" but Jean said he didn't want to fight and tried to walk away, the report said. Jacob Springer appears in bond court. Jean "placed his hands behind his back to show no interest in fighting," the report said, but when Springer punched Jean in the face, Jean defended himself. A witness reported seeing Springer punch Jean after Jean had placed his hands behind his back, the report said. Springer went to his car and grabbed a sharp object that Jean thought could be a knife, and Springer yelled "I'm going to cut you!" before getting in his car and driving away, according to the report. Deputies found Springer at his home in Weston, where he was taken into custody. Springer was taken to the Cleveland Clinic where he was treated for his injuries before he was booked into jail. Jean suffered a laceration to his nose, the report said. Springer was charged with assault and battery on a public or private education employee. He was ordered held on $8,500 bond on Sunday and was later released. Attorney information wasn't available. The school declined to comment on the incident, and it's unknown why Springer was expelled.